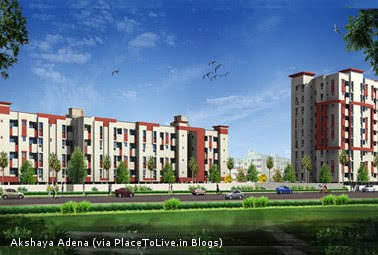 PlaceToLive.in - Blogs: Akshaya Adena (Padur, OMR) booking commences. Starts at 17 Lakhs - special rates for 2 Days. Akshaya Adena (Padur, OMR) booking commences. Starts at 17 Lakhs - special rates for 2 Days. Booking has (at last) commenced for Akshaya's Adena project at Padur, OMR. Akshaya has announced special rates for just 2 days, which is slightly lesser than what we reported had earlier (Rs.2770/sqft and 18 Lakhs). Now the rates start at Rs.17 Lakhs and works out to Rs.2700/sqft. The special rates are available for just 2 days - Aug 22nd and 23rd. There will be a total of 199 apartments coming up in in the following sizes and rates..
* Seats in bathroom, for seated bathing. * Trolleys for moving gas cylinders. * Round the clock medical care - via a clinic to be set up within complex. the following amenities are also available.. The booking announcement comes 4 months after giving a hint of Akshaya Adena, when Alliance Gardens was announced. For more details on the project including location on Google Maps, see PlaceToLive.in listing of Akshaya Adena.